The Juice Fountain Elite, also known as Breville 800JEXL is sure to catch your attention with its engineering grade polymers and heavy, die-cast metal heavy construction making it extremely sturdy and steady as you juice. This centrifugal juicer is highly powerful with a 1,000-watt motor and two-speed settings going from 6,500 to 13,000 RPM. 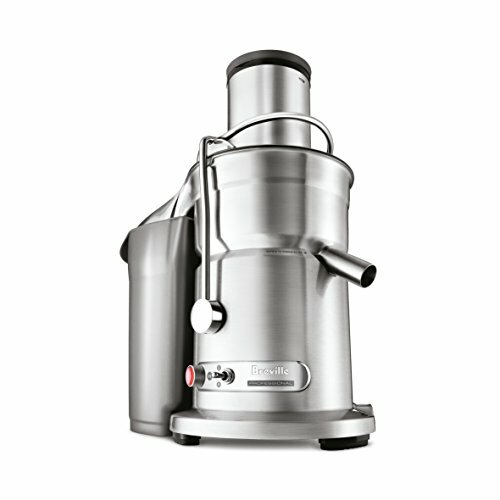 Just in case you are new to juicing, a centrifugal machine extracts large quantities of juice at high speeds. This type of juice extractor is fully capable of juicing just about anything but it is strictly for juicing and is not multi-functional compared to Breville BJE820XL. The dual stainless steel, titanium reinforced cutting discs sit directly under the three-inch feed chute improving juice extraction efficiency. If you are juicing in large quantities the juicing jug is capable of being filled up to 1.1 quarts and the pulp container is approximately 3.2 quarts, which is rather overkill, but definitely gets the job done. Commercial performance but it’s only intended for home and personal use. Juice Fountain Elite is easy to assemble and dismantle after use. It comes with a safety locking mechanism that does not allow operation unless it is in place. While it can juice anything, it’s not highly efficient with leafy greens. However, it can be done if you make sure they’re tightly rolled in the center. Another trick to juicing leafy greens is to wrap them around something, like a carrot, to help them through the electric juicer. This juice maker is even powerful enough to juice whole apples! Make sure to use the food pusher to help everything feed down into the blades. The last thing to mention is about the noise. Depending on your tolerance level, this machine may or may not be quite noisy. Do not worry though, it juices at such high speeds that it isn’t too long before the noise is over. It is highly easy to clean. Simply remove the parts from the juicer. Rinse everything off. You can either wash everything by hand or place the parts in the top rack of the dishwasher. However, the stainless steel mesh strainer and the food pusher is not dishwasher safe. Take the provided cleaning brush and clean it by hand. Even though you can place the other juicer accessories into the dishwasher, it is always best to wash the parts by hand and allow them to air dry. The strainer is the piece that will take the longest to clean and remove the remaining pulp. When compared to other fast juicers on the market, Breville 800JEXL manages to extract the highest yield due to its patented system of central loading down the axis of the filter basket. It extracts up to 30 percent more yield and 40 percent more nutrients than other juicers. While there are small amounts of foam and oxidation, considering it is a centrifugal juicer, it does an amazing job yielding delicious, high quality juice. It preserves the longevity of the vitamins, nutrients, and the enzymes in spite of the high speeds of the juicing process; producing a tasty juice that can be stored for at least 24 hours in a tightly sealed, glass container. What Kinds of Produce Can The Juice Fountain Elite Process? This juicing machine can process hard produce, soft fruits and citrus fruits. Hard produce includes cilantro, pear, pineapple, coconut, asparagus, watermelon, cucumber, apple, yakon, garlic, cauliflower, celery, fennel, bitter gourd, beets, sweet potato, carrots, pepper, turmeric, pumpkin, ginger and broccoli. Citrus fruits include orange, tangerine, lime, grapefruit, mandarin and lemon. Using the low-speed setting you can process soft fruits such as peach, tomato, melon, mango, blackberry, kiwifruit, papaya, grapes, avocado, strawberry, cranberries and pomegranate for making a puree. The short answer is no, centrifugal juice extractors are not efficient for juicing green leafy vegetables, let alone making soy and almond milk. Thus, it’s not advisable for juicing any of the following—collard greens, moringa, kale, lettuce, beet greens, peppermint, wheatgrass, parsley, spring onion, dandelion greens, basil, brussels sprout, cabbage, pine tree needles, romaine lettuce and spinach. 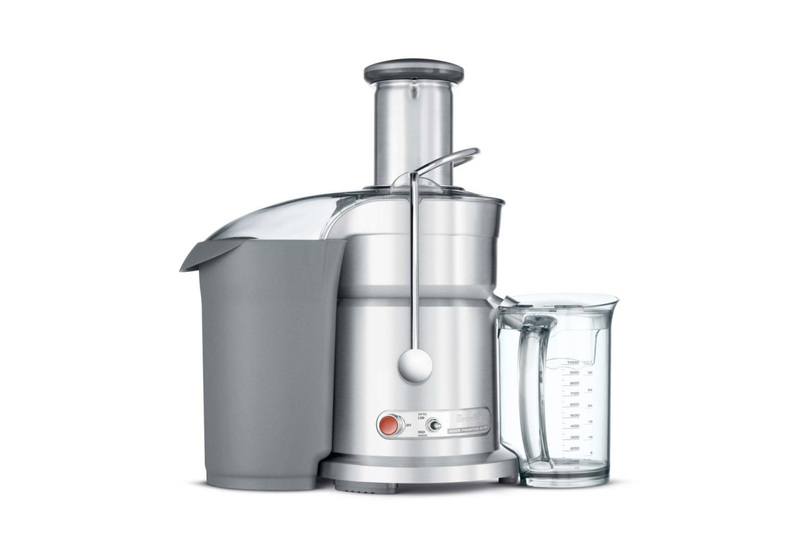 Breville Juice Fountain Elite 800JEXL is the “best in class” among centrifugal juicers out on the market. Not only is it capable of preventing heat buildup as it extracts juice from your fruits and vegetables, but it also has a built-in sensor that automatically shuts the machine off in case it does become overworked. The micromesh filter is made of sturdy stainless steel enclosing the sharp, titanium reinforced cutting disc. It weighs 19 pounds and is small enough to fit on just about any size counter. This machine is a solid choice and has been compared to many masticating juice extractors, producing high quality juice capable of being stored for at least a day or so in a tightly sealed container. The only real downside to this juicer is the manufacturer’s warranty is only for one year. It could stand to be longer to put it on par with other warranties on the market. Thankfully, a multitude of users have not had any problems with their juicer. This dual-speed juicer will meet all of your juicing needs in record time.